For decades, laboratories have been tinkering with screening techniques. Some of these screening techniques exploit gene-silencing mechanisms such as RNA interference (RNAi); others incorporate genetic engineering tools such as transcription activator-like effector nucleases (TALENs) and zinc finger nucleases (ZNFs). Initially, these techniques were expected to progress quickly. Before too long, however, they were beset by complications. Many screens proved disappointing because they lacked specificity or generated off-target effects. Just when users of screening technology might have resigned themselves to lowered expectations, a new technology with screening potential emerged. In 2005, CRISPR was recognized as a bacterial immune system, and a CRISPR system component, Cas9, was shown to have nuclease activity. Just a few years later, in 2013, CRISPR-Cas9 was harnessed for genome editing and, crucially, shown to be capable of targeting multiple genomic loci, prompting many laboratories to incorporate this high-precision technique into existing experimental workflows. The power of CRISPR is the unprecedented ease with which it may be programmed to target selected DNA locations. Although the technology has been widely heralded for its potential to cure heritable diseases in people, CRISPR is also being used to dramatically enhance the speed and precision of genome-wide screening in the laboratory. Moreover, CRISPR screening applications are becoming more diverse, improving our understanding of drug resistance, gene essentiality, the factors that regulate viral infection, the drivers of cancer metastasis, and the roles played by noncoding regions of the genome. CRISPR inspires beginning and established researchers alike. For example, Julia Joung, a PhD candidate working in Broad Institute laboratory of Feng Zhang, PhD, came across CRISPR during her undergraduate years at Stanford University. She immediately recognized its potential. CRISPR’s possibilities are also being explored by leading researchers such as Gus Frangou, PhD, a senior fellow at the Harvard T.H. Chan School of Public Health. According to Frangou, the transition to CRISPR “was the logical next transition from what we were doing with RNA interference.” Researchers rapidly developed different types of CRISPR screens, including knockout screens, activation screens, and inhibition screens. 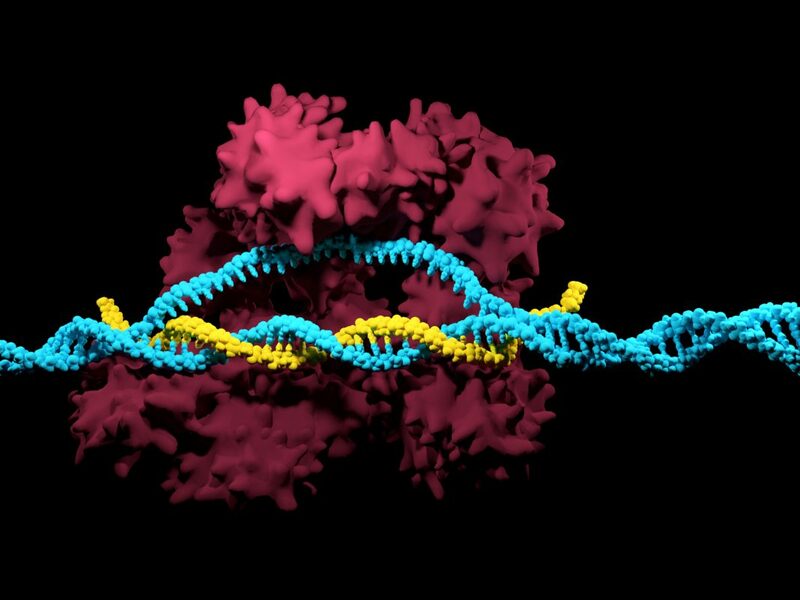 “The whole toolbox of CRISPR technology [keeps] expanding,” says Frangou. Most of the CRISPR screening applications used so far have been knockout screens, in which scientists study the function of a candidate gene by using molecular scissors to render it nonfunctional, and then compare that model to a healthy version. A typical CRISPR-Cas9 screen starts with a library consisting of guides that target genes that have been annotated in the genome. Then, the library of guides is introduced into a pooled cell, which is then enriched for cells that contain the phenotype of choice by applying selection pressure. The process culminates with a list of candidates corresponding to genes that became enriched in selected cell populations. In 2017, for example, scientists at the gene editing company Horizon Discovery reported the first combination of three screening approaches—CRISPR knockout, CRISPR interference, and CRISPR activation. These scientists described how they used their combination screen to study drug resistance. Specifically, they identified factors that influence resistance and sensitivity to vemurafenib, a melanoma therapeutic. CRISPR technology is used for purposes other than probing gene function. For example, several scientific teams, including one at the biotechnology company IONTAS, have used CRISPR technology to generate large mammalian antibody libraries. Regardless of the application, CRISPR has enhanced the speed and precision of screening, helping scientists uncover new drug targets and better understand the genome. Molecular oncologists have been hunting for a “magic bullet” in cancer genomics for decades. Today, however, there’s a growing recognition that cancer metastasis is driven by a complex and dynamic series of mutations. Now, scientists such as Harvard’s Frangou are using CRISPR to interrogate that complexity in breast cancer mouse models. Specifically, Frangou and his colleagues scaled up their platform until it could perform 45,000 different knockdowns in one sample—a dramatic improvement over prior knockdown approaches, such as RNAi. They also included a barcode in their lentiviral cassette that allowed them to quantify guide RNA and to monitor transcriptomes by having edited cells express reporters. Finally, Frangou added an imaging modality that allowed his laboratory to monitor cells in the tumor as they move around the mouse. This system has become so refined it allows Frangou to explore and identify some of the molecular underpinnings of metastasis, and to derive insights that have broad implications for breast cancer drug development. The vast majority of the human genome consists of noncoding DNA, which includes sequences that serve structural functions, present binding sites for regulatory proteins, or are transcribed to produce noncoding RNAs, some of which are functional, and others, not. Noncoding RNAs should be scrutinized, suggests Joung, to determine whether they contribute to diseases for which genetic origins remain undefined. “A lot of these noncoding regions can regulate the coding genes, so it becomes very important to … start looking beyond the coding genome,” Joung emphasizes. After developing a CRISPR-Cas9 activation screen targeting more than 10,000 long noncoding RNA loci, a Broad Institute team that included Joung identified 11 long noncoding RNA loci that, upon recruitment of an activator, mediate resistance to BRAF inhibitors in human melanoma cells. Not all genes are created equal. Some are essential for the reproductive success of an organism, and identifying which genes are considered essential to humans has been one of the major projects to stem from the Human Genome Project. Essential genes, or “core fitness genes,” are now being compiled into libraries by researchers using CRISPR screens. One of these researchers is Jason Moffat, PhD, associate professor, Department of Molecular Genetics, University of Toronto. He asserts that using CRISPR yields “cleaner data from genetic screens (true positives) over older technologies like RNA interference.” He adds that compared to haploid mutagenesis—a genetic screening approach that employs cells with a single set of unpaired chromosomes—CRISPR offers more flexibility and accessibility to a wider range of cell lines. Moffat’s group was the first to propose the Daisy model of gene essentiality, a major step forward in the effort to define a set of universally essential genes. Moffat’s group also defined the first set of “core essential human genes.” To do so, the group used high-complexity CRISPR libraries. In addition to charting new territory for understanding gene essentiality, Moffat’s laboratory has developed algorithms that scientists can use to score the quality of CRISPR screening data. As the inventor of antibody phage display, McCafferty is no stranger to the transformative power of technology that extends our ability to assess antibody specificity. Now, as the founder of a new antibody drug discovery company, IONTAS, McCafferty is creating large antibody libraries in mammalian cells. The IONTAS approach is to generate stable cell populations in which each cell contains a single antibody gene. “We’ve been working, for the past five or six years, on the problem of how to make a mammalian antibody library,” said McCafferty. The solution, according to McCafferty, is homologous recombination enhanced by nuclease cleavage at a target locus. Cleavage can be accomplished using gene editing tools such as ZFNs, TALENs, and now, CRISPR nucleases. When IONTAS scientists started working on this problem, they used TALEN technology, but then they considered whether an alternative approach would be advantageous. “CRISPR was very exciting,” McCaffery recalls. Although older screening techniques such as those involving RNAi or TALENs continue to be used, more and more laboratories will continue to incorporate CRISPR screens to take advantage of the precision and efficiency afforded by this new technology.